Coming from the north on the A20 Exit 54 (GRAMAT - GOUFFRE DE PADIRAC). Keep on towards Gouffre de Padirac (Padirac Chasm) until you reach Padirac village. At Padirac, turn right towards ST CERE (D.673 for 1 kilometre). Turn right towards GRAMAT (D.60 for 1 kilometre). 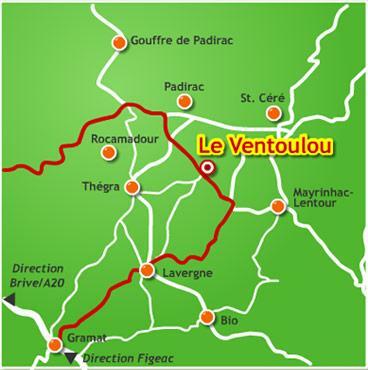 Cross the D. 14 towards MAYRINHAC-LENTOUR, and LE VENTOULOU Campsite is 1 km away. Coming from the south on the A20 Exit 56 (GRAMAT). Keep on towards GRAMAT. At GRAMAT head towards ST CERE (D.807). 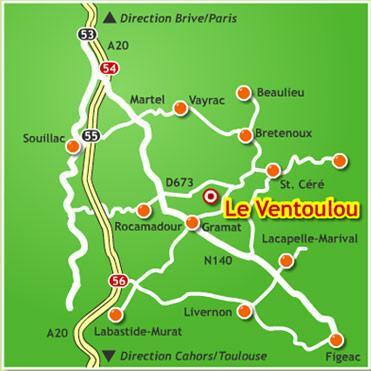 Pass through the village of LAVERGNE and continue for 3 kilometres until you reach the AYNAC - MAYRINHAC-LENTOUR intersection. Turn left onto the D.60 towards GOUFFRE DE PADIRAC - LE VENTOULOU Campsite is 1.3 km away. By Plane: Brive approx. 40 km (www.aeroport-brive-vallee-dordogne.fr).